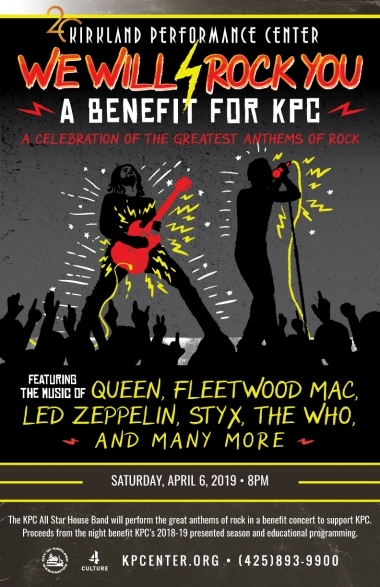 The KPC All Star House Band will perform the great anthems of rock in a benefit concert to support KPC. “Don’t Stop Believing”, you can climb the “Stairway to Heaven”, yell “Freebird”, and shout “more cowbell”, experiencing the epic and iconic standouts of rock. Proceeds from the night benefit KPC’s 2018-19 presented season and educational programming. Hailing from Kirkland, Washington, The KPC All Star House Band is comprised of KPC favorites Geoffrey Castle (violin) and Creme Tangerine alums Byron Prather (vocals), Chuck Dorsett (keys), Rick Jones (bass), Jakael Tristram (guitar) and KPC Executive Director Jeff Lockhart (drums). The members of the band perform for thousands each year and will create a dynamic live music experience filled with energy, fun and spontaneity – thrilling with its unique renditions of rock’s greatest anthems. 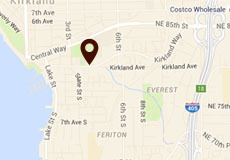 KPC exists to provide cultural enrichment for the Eastside community, and is a gathering place to be a community connected by culture. 100% of the proceeds of the We Will Rock You concert will support KPC’s continued efforts to enrich the surrounding community with events of entertainment, educational, and cultural value but will help to sustain the organization for seasons to come. Since opening in 1998, over 800,000 patrons have walked through KPC’s doors; and all of those patrons have been essential to KPC’s success. A portion of your ticket is a tax deductible donation to KPC. For the $75 ticket, $50 of that is a donation, and for the $150 VIP ticket, $110 is a donation. There are only 30 VIP tickets available, which include a reception in The Kirk, KPC’s VIP lounge. There will be also be a raffle for $20 (cash only) in the lobby. Two lucky winners will be called on stage to play the cowbell during the show. Purchase raffle tickets for your chance to be a star! Raffle tickets will be cash only, and you can purchase as many as you want.